The FrontPoint Pod™ gives you opportunities you did not have before. By placing your external pods at strategic places, not only do you increase availability for your customers – you underpin and strengthen your brand on the market as an innovative and customer focused company. With a FrontPoint solution you reach your customers where your customers are, and with its functions you can serve your customers in a way that was previously impossible. Check-in and check-out, issue keys, receive card payments – you yourself decide what functions you want in your FrontPoint system. 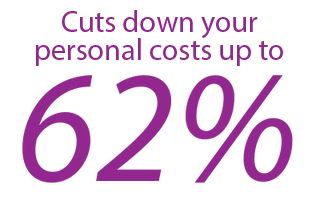 By using FrontPoint Pods™ you can reduce your personnel costs compared to traditional staffing by up to 62%*. Test new markets Do you want to grow your company in new markets? Seek new business openings? By placing our FrontPoint Pod™ in a new community, a new region or during an event, you have a simple and effective way to try new markets in an extremely cost-effective way. Is the market on the move? See to it that you are where your customers are. With a FrontPoint system you can quickly and simply set up business at the locations that need your services at only certain times of year. *Calculation is based on average personal costs for hired receptionist and operating costs of one FrontPoint system.